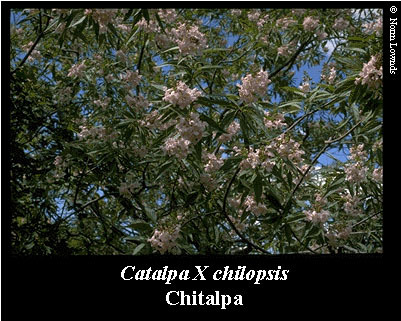 The Chitalpa is a deciduous tree that grows twenty to thirty feet in height, and can get twenty feet wide. 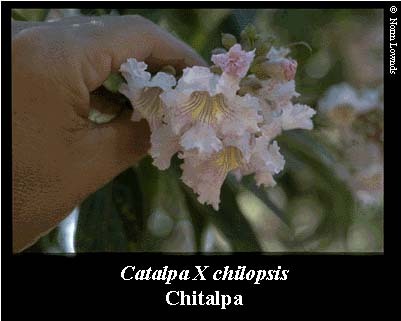 It combines the larger flower of the Catalpa with the color of the Chilopsis, which would be clusters of frilly trumpet shaped, pink to violet flowers. The leaves are four to five inches long, and about one inch wide. This tree is a fairly fast growing tree, and can suffer from cracks in its bark caused by its fast growth. 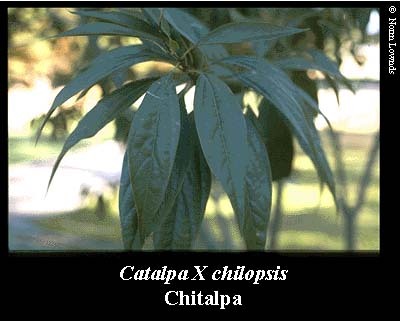 Other problems with the tree are it is susceptible to early frosts in the fall, and also is commonly infested by black aphids and thrips. All in all this tree is water efficient, desert tough, and is a good tree for landscapes with pretty flowers that bloom throughout the year.